As the halt along the canal was unscheduled, onlookers were few at the departure of the test convoy last Thursday at 10:00 p.m.
A big surprise awaited joggers and bikers accustomed to the quiet track that runs along the EDF canal close to the village of La Roque d'Anthéron, some 35 kilometres to the west of Aix-en-Provence. On Thursday morning, the whole width of the track was blocked by a huge vehicle loaded with hundreds of concrete blocks and guarded by two security agents. 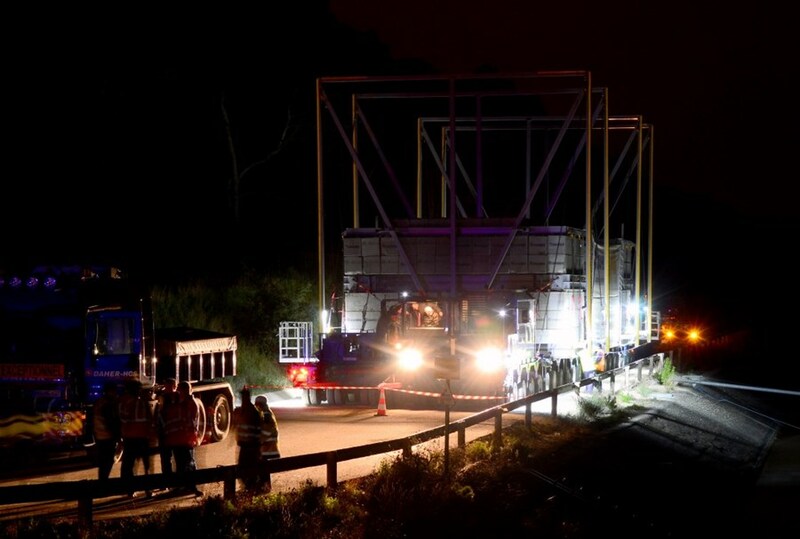 On the second night of its progression toward the ITER site, the test convoy had not planned to stop there. But a second technical incident, following a failure in the trailer's hydraulic system the previous night, had led the organizers halt the convoy at this stop. 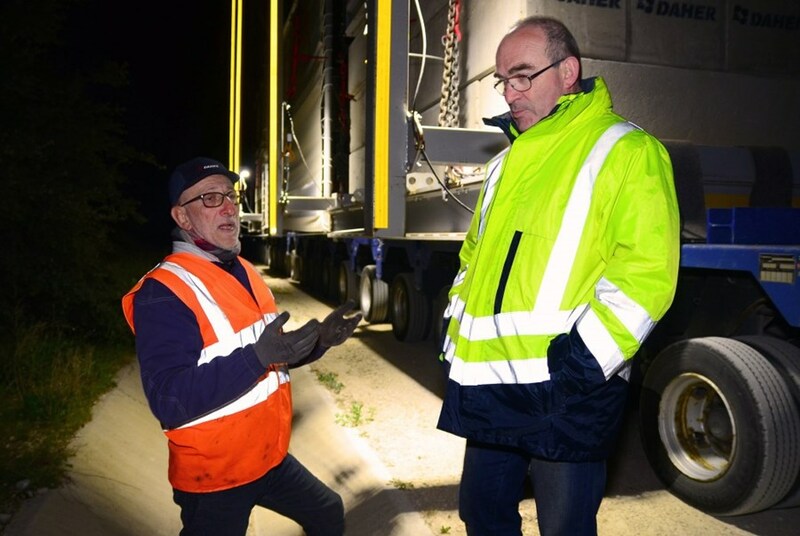 Prior to the departure of the convoy, Bernard Bon, DAHER head of convoy (left) and Pierre-Marie Delplanque, Agence Iter France managing director, discuss the technical incidents of the previous nights. The second incident was also related to the hydraulic system. By the time the faulty seal was identified and replaced at 2:50 a.m., three hours had elapsed leaving only a few hours before the break of day. 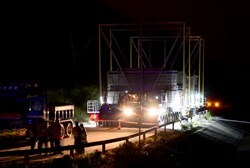 As the ITER convoys are allowed to drive only at night in order to limit the disturbance to the local communities the trailer was brought to a halt at 5:00 a.m., 20 kilometres before Meyrargues—its planned destination and the last stop before the ITER site. As a consequence, the schedule had to be promptly reorganized. It was decided that the convoy would leave its improvised parking slot along the canal at 10:00 p.m. on Thursday night to reach Meyrargues, where it would park for the weekend. It is now expected on the ITER site at 6:00 a.m. on Tuesday 8 April instead of Friday 4 April as initially anticipated. "The incidents we suffered have helped us identify what could, and should be improved," explained Bernard Bon, DAHER head of convoy. "This is precisely what such tests are for." The 352-wheel, 800-tonne trailer is being readied for the 20 kilometre ride to Meyrargues. 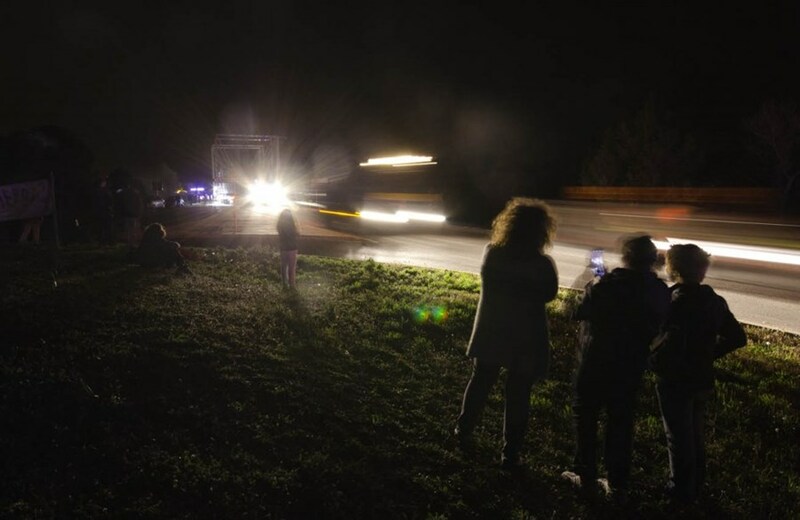 The convoy is now expected at the ITER site on Tuesday 8 March at 6:00 a.m.
As it progressed toward Meyrargues on Thursday night, the convoy organization was also tested in a quite unexpected way. Two vehicles tried to force their way through the protective "bubble" that surrounds the convoy. Coming face to face with a sizable contingent of Gendarmerie forces, the drivers took a sharp U-turn and sped into a residential area where they abandoned their vehicle; they were eventually apprehended by Gendarmerie motorcyclists. In the abandoned cars authorities found an abundance of wine bottles, the probable product of a burglary. The incident delayed the convoy by 18 minutes.